Treasury yields are surging again today, no doubt adding fuel to the debate over whether the Fed's "credit easing" policies are working. The good news is that today's rise can probably be pinned on promising data out of the construction and manufacturing sectors, as Bloomberg suggests. Still, those who read the rise in rates since March as a sign that investors are worried about inflation and/or ballooning deficits are unlikely to quiet down. But Texas State University economist David Beckworth points us to another piece of evidence that rising yields are a byproduct of improved economic conditions: Gross Domestic Income (GDI). A little background: Theoretically, GDP and GDI are both supposed to track economic activity and so should be roughly equal. 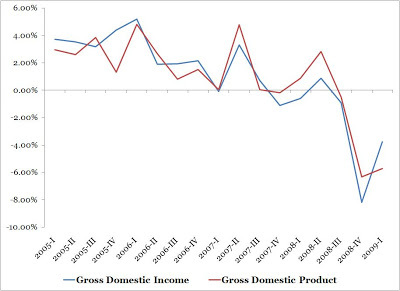 (GDP measures economic activity by looking at expenditures while GDI tries to measure activity by tracking incomes.) But there's actually a systematic discrepancy between the two. As you can see, GDI recovered much more sharply in Q1 than GDP (actually, the change in the rate of decline for GDI was much sharper), suggesting that a rise in rates may indeed reflect an improving economy.